It’s not unusual to come across a magical theme in the world of online slots. NextGen has taken a new slant on that theme to create Spin Sorceress, a slot game that features a number of intriguing features. It’s in 3D too, which might tempt you to have a closer look. 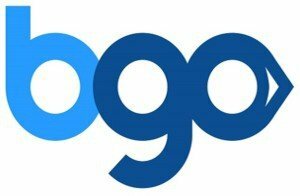 10 no deposit no wager free spins on sign up + 100 No Wager free spins on first deposit! 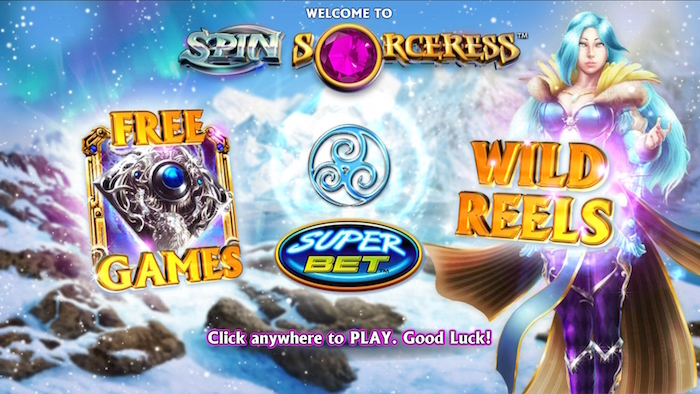 The Spin Sorceress slot is a 5 x 3 slot game that uses the 243 ways to win game structure. The mystical theme works well and you can look forward to the prospect of Sorceress Free Spins, not to mention huge multipliers (as much as 50x your bet) if you enable the Superbet option. You’ll find yourself in a snowy landscape when you begin the game, and the reels are arranged in front of it. The Spin Sorceress online slot game features some sharp graphics and it’s easy to see where the control buttons are too. When you get a winning combination, those symbols will glow so you can see where your winning line is. The amount you’ve scooped is clearly shown in the bottom centre portion of the screen. This also reveals other elements of the game you might encounter. The payout table is spread over five pages. This reveals the wolf is the highest-paying symbol, with a 500-coin win for five on a line. 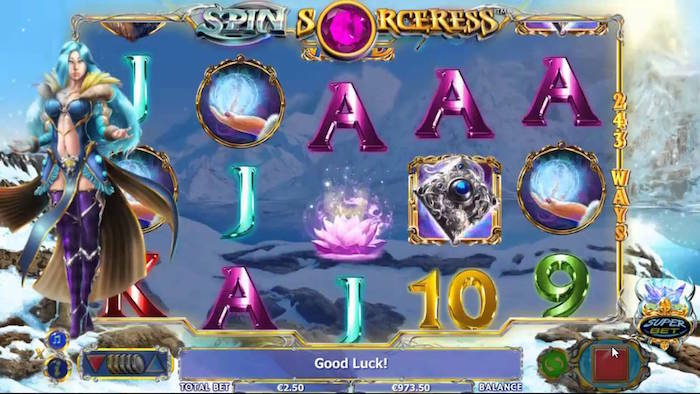 Various other mystical symbols are also included in the Spin Sorceress online slot, although you will also see the A, K, Q symbols, as well as the J, 10 and 9. This is a bit disappointing; you can’t help but feel a little more effort could have easily led to a number of other more relevant symbols being included. That aside, some symbols are of course worth more than others. While the sorceress herself is not worth anything, she does have the power to stand in for everything else in the game, with the exception of the scatter. As you may now realise, the sorceress is the wild. She will pop up on any of the middle three reels. When this happens, that reel turns wild. This means you are guaranteed to have a wild on that reel. The scatter looks to be a gem set in a square silver ring of some kind, but it’s a little hard to tell. It is easy to spot though, which is the main thing. If you can find three of them, you get 10 free spins on the reels. The best thing about the freebies is that a maximum of three sorceress wild reels will appear on each and every spin. This means you’ve got a superb chance of putting together multiple wins on the reels for every one of those 10 spins. Now let’s take a look at the Superbet feature. This is an optional feature, and it does require you to increase your minimum bet. You have to play 25 coins per spin with Superbet turned off. There are five levels to the Superbet feature, and each one requires you to bet more coins. The first level requires you to double your bet to 50 coins, but in doing so, the wild wins enjoy an increased multiplier of 2x, 3x or 5x your bet. As you can imagine, the higher you go up the levels, the bigger the potential wins could be. Superbet level five takes up 500 coins per spin, but if you get a wild win it could trigger a 20x, 30x or even a 50x multiplier to reach bigger prizes. This NextGen slot game uses a minimum 25-coin bet to get you started. This is quite common when it comes to the 243 ways to win games, as there are no real paylines to use. You can get started from a mere 25p per spin, which we think is quite reasonable for that many winning opportunities on each spin. The maximum bet is £50, but you need to bear in mind the Superbet feature as well, and how that can affect the amount you wager. Turn that on to the maximum and the biggest bet soars to £1k! You may have noticed the RTP has a range rather than a single figure. This is because the normal return would be at the lower end of the figure. If you use the fifth Superbet level and scoop the jackpot with a 50x multiplier, the RTP will be near the top end of the figures. NextGen Gaming has long been capable of turning out some impressive online slots for UK players. In our opinion, they’ve come up with another winner here. There are just enough unusual features included to make the game stand out from the crowd – surely something that is almost essential for a game to grab your attention nowadays. With the addition of the Superbet feature, it’s a great game for big-stake players to use as well. To that end, we can see how it would appeal to everyone.